The song's name may not be apt but the lyrics "if you're gonna do it, do it right" from Wham's 1980's smash hit 'I'm Your Man' perfectly summed up the scintillating brilliance of Apple's Jade at Fairyhouse yesterday. Gordon Elliott's mare had top billing at the Meath track and she didn't disappoint by obliterating a quality field and plundering the Grade One baroneracing.com Hatton's Grace Hurdle for the third successive year. Twenty lengths was the winning distance from Jessica Harrington's Supasundae (9/2) - which battled as gamely as ever despite clearly needing his seasonal debut - but there was only ever one horse in it. Jack Kennedy stalked the pacesetting Wicklow Brave aboard Apple's Jade (4/6 favourite) before taking it up three out and powering further clear with every stride to leave the Kerry teenager gushing. "She was unreal. It's a dream to be riding a horse like this. It's some achievement for a horse, even to win three Grade Ones is an achievement in its own right, she's class," he said. Joining greats like Limestone Lad and Solerina as three-time winners, her feat is all the more noteworthy as a six-year-old and it's not inconceivable to think that she could possibly double her tally if staying sound. As jaws were still being picked off the ground after a foot-perfect jumping display, the debate raged about a possible tilt at the Champion Hurdle - she was cut to 6/1 from 12/1 - and back-to-back winner Buveur D'Air. Kennedy was in no doubt that it is within her capabilities: "She definitely wouldn't be disgraced but the Mares' Hurdle is there for horses like this too. I wouldn't mind riding her in any race to be honest." A Champion Hurdle bid is unlikely with owners Gigginstown having Samcro in that department and the Mares' Hurdle - which she won last year and is as short as 5/4 - is the likely option, according to Elliott. A 62/1 four-timer yielded another memorable day for the Cullentra handler at his local track with Delta Work (10/3) advertising his chasing potential with a gutsy performance in the Grade One Drinmore Novice Chase. Despite Davy Russell losing his irons just after the last - which he badly blundered - last year's Pertemps Final winner showed plenty of stamina to mow down Barry Geraghty on Joseph O'Brien's Le Richebourg (11/4 favourite) in a thriller. Gigginstown boss Michael O'Leary became the most successful owner in the race's history as a result and given the Ryanair chief's thirst for top-class chasers, Delta Work could well be a Gold Cup horse in the making. 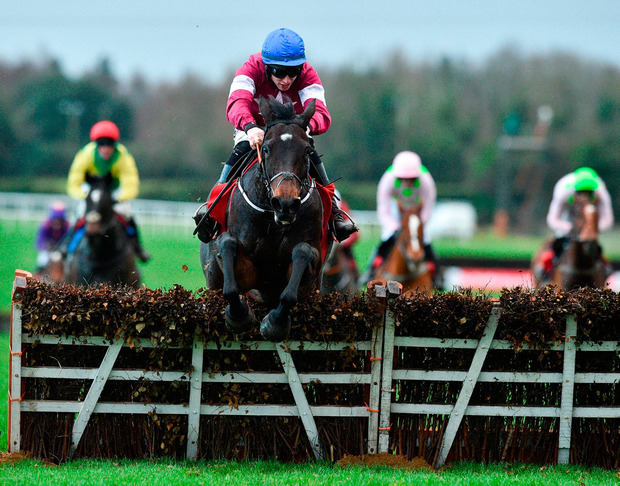 Don Cossack - winner of the 2013 Drinmore - secured blue riband success in the famous maroon and white silks and Delta Work has shortened to 8/1 favourite for Cheltenham's National Hunt Chase while also being cut to 10/1 for the RSA Chase. "He nearly threw the race away but you'd love the way he picked up from the back of the last to the line. All he does is jumps and stays. It was a good performance to come back and do what he did," Elliott said. Elliott's quartet was completed by a double for owners Cheveley Park Stud with the Russell-ridden Chief Justice (5/1) taking the Grade Three Juvenile Hurdle in a head bobber with stablemate Coeur Sublime (8/11 favourite), while €450,000 purchase Envoi Allen (4/9 favourite) overcame greenness late on to justify her price tag in the concluding bumper. Willie Mullins secured his eighth victory in the Grade One Royal Bond Novice Hurdle with Ruby Walsh back to his best with an expert front-running ride on Quick Grabim (evens favourite) to earn a quote of 14/1 for the Supreme Novices' Hurdle. Walsh ended a 264-day wait for Grade One success - in the colours of 1997 Gold Cup winner Mr Mulligan for owner Geraldine Worcester - since Benie Des Dieux took the Mares' Hurdle at this year's Festival. Russell completed a 112/1 three-timer when timing his late run to perfection aboard Wonder Laish (10/3 favourite) for Charles Byrnes in the penultimate handicap hurdle as "there's only one Davy Russell" rang out around the parade ring in celebration of his exploits. It was also a special day for the father and son combination of Philip and Luke Dempsey as Dinnie's Vinnie (16/1) secured his seventh career success with a bold jumping display in the Porterstown Handicap Chase.